An innovative software system that mines information from social media sources has won a three member student team from the University of Johannesburg (UJ) a place in the final of a global technology competition in St Petersburg, Russia in July 2013. 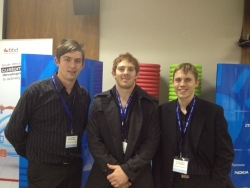 Team SentiMeter, who comprises of Jan van Niekerk and Merrick Bengis, both Master’s IT students, and Lorenzo Boccetti, a Honours IT student at UJ’s Academy of Computer Science and Software Engineering, beat off the challenge of some of the top computer programming students from across the country to win the South African leg of the Imagine Cup 2013, a Microsoft-sponsored technology competition which pits the world’s best student programmers against each other. The finals of the South African Imagine Cup were contested by 14 teams in various categories who were selected from over 70 initial projects. Team SentiMeter’s system, which is a business analytics platform that mines information from social media sources to create a global perspective on any issue expressed in the social media sphere, was judged the best entry in the final of the competition. Judges commented on the outstanding quality of the system and the innovative use of technology. In a show of continued active involvement in such a prestigious national event, a total of four projects developed by Master’s, Honours and Third-year students at the Academy of Computer Science and Software Engineering (Faculty of Science), under the mentorship of the Academy, were entered into the Innovation and World Citizenship competition category. Dr Ian Ellefsen, a senior lecturer at the Academy, says computer science has become an essential part for driving innovation and development. “It acts as the backbone for rapid development in a country. Our students’ projects speak volumes about the promise of technology to advance the way we think, work and communicate in South Africa, and abroad,” he said.